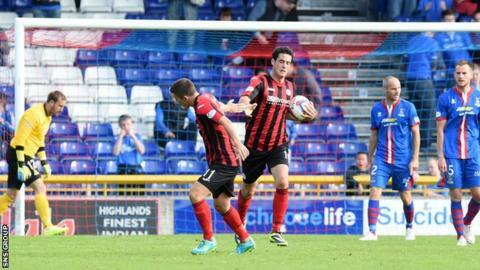 Manager Tommy Wright welcomed Murray Davidson back from long-term injury but did not find many other positives from St Johnstone's 2-1 loss in Inverness. The midfielder made his first appearance since January as a late substitute. "Murray showed he was ready. He had that urgency and got about the pitch," Wright said. "Adam Morgan also did very well when he came on. But we should have done better before waiting until we went 2-0 down." Caley Thistle dominated possession and struck twice in five second-half minutes after an hour. Brian Graham reduced the deficit with 12 minutes remaining but Saints could not find a leveller and remain in the bottom half of the Premiership. "We didn't get people high enough up the pitch and guys need to be braver on the ball," Wright added. "We had possession in midfield, but it was always going to someone in defence. Someone needs to take responsibility to move it forward, instead of square or backwards. "We want to keep possession but we need to threaten the opposition."